Serving as the 2015 ACP Ambassador for Chile and Uruguay has been a unique and rewarding experience. In Chile, the ACP Governor, Professor Guillermo Conte, MD, FACP and his wife Maria Eugenia were the consummate hosts. The 48th Annual Meeting of the ACP Chile Chapter and the Sociedad Médica de Santiago, entitled "ACP Internal Medicine from North to South" was nothing short of superb. The meeting was organized by Dr. Raimundo Gazitua an enthusiastic young leader in the Chile Chapter. The poster presentations of the residents were of extremely high quality. Interestingly, the "posters" were presented electronically! I was amazed at this unique innovation in a dedicated room for the residents and students utilizing individual screens technologically wired for the presentations. The enthusiasm of the young students, residents and faculty was palpable. Listening to the different problems facing medicine in Chile sounded very familiar-the very same external "contrafuerzas" we have in the United States seemed to have also evolved in South America. However, the physicians in Chile have the same optimistic outlook for the research and advances that the United States physicians have for improving patient care. I had a wonderful time meeting the Governor-Elect, Dr. Luis Miguel Noriega, FACP and the immediate-past Governor Dra. Mariá Eugenia Pinto, FACP. 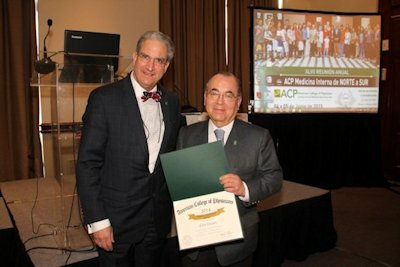 Both are strongly committed to the Chilean Chapter and the ACP as is Dr. Jorge Vega, FACP, who is the current President of the Sociedad Médica de Santiago-Sociedad Chilena de Medicina Interna. There was unanimity in embracing my presentations on High Value Care (HVC). I encouraged our Spanish-speaking brethren to adopt HVC as their own: Cuidado de Alto Valor-CAV. It was a real pleasure to have spent some time with Dr. Jose A. Rodriguez Portales, MACP, and a former College Regent. Dr. Rodriguez has written a wonderful book titled The American College of Physicians in Chile-Six Decades of Collaboration with the Nation's Internal Medicine. Simply stated it represents an extraordinary and successful effort to summarize the history of the ACP in Chile. I had the exceptional honor and privilege of meeting Dr. Enrique López Caffarena, MACP, who received the Chilean Chapter's Centennial Award. It was an awe-inspiring moment for me to meet the physician who organized the very first ACP International Chapter in South America! Travelling to Montevideo, Uruguay was a terrific experience. My host was Professor Juan Carlos Bagattini, MD, FACP, who also attended the Chile Chapter meeting in Santiago. In fact, he has attended all of the meetings uninterrupted in Chile since 2003. Although Uruguayan, Dr. Bagattini is so well respected that he has received the Chilean Chapter Laureate Award! Dr. Bagattini aspires to create a Uruguayan ACP Chapter soon. We sat together on the airplane as it crossed the Andes from Santiago to Montevideo and discussed the similar problems facing doctors and patients in both countries. Dr. Juan Carlos ("J.C.") is a force of nature and has the utmost respect of his colleagues in Uruguay. The two-day meeting was titled "Sixth Conference Updates in Internal Medicine" was co-sponsored by the Sociedad de Medicina Interna del Uruguay, the American College of Physicians, and the Hospital Britanico Montevideo) and was attended by over 100 physicians, residents and students at the Hospital Británico. The meeting's first day focus was on the care of the pregnant patient while the second day explored endocrine problems, with particular emphasis on thyroid disease. My presentations on High Value Care (Cuidado de Alto Valor-CAV) as well as resources of the ACP were avidly embraced. Again, the medical students, residents and faculty hold the College in high esteem. I thoroughly enjoyed dinner and conversation with Drs. "J.C." Bagattini, Maria Pilar Serra and Leonardo Sosa from Montevideo. Joining us from Argentina were Drs. Erika Abelleira and Alejandro Garcia. My special thanks to Dr. Mario Llorens, President of the Sociedad de Medicina Interna de Uruguay and Dr. Jorge Stanham, President of the Comité de Educación del Hospital Británico for supporting scholarly activities jointly with the ACP. In summary, my sojourn as the 2015 ACP Ambassador to South America was nothing short of spectacular. I will never forget the warmth and genuine friendship extended to me by Drs. Conte and Bagattini. There leaves no doubt that with their solid and enthusiastic leadership the College will continue to grow and flourish in Latin America for the next 100 years!